Stepping away from the Neverland controversy (I do promise more images later, folks) — I wanted to make one point more-then-ever-so-abundantly clear: Clean, free energy is attainable. In fact, mark my words, in about 20-30 years, we’ll have a solution in the bag. The question remains: which is the best solution? Currently, I personally see three possibilities on the horizon, and I’m going to review them here, along with their benefits and limitations. Many may not realize that we have in our hands the technology to create a completely self-sustaining continuous and limitless form of energy. The process basically involves recreating the forces of the sun and bringing them to a large underground Tokamak – basically a big, cylindrical tube surrounded my magnets – to isolate the energy of the reaction and drive that heat energy to turbines. The joint European torus in the U.K.. This is the most efficient nuclear fusion reactor thus far, but ITER promises to be 10-15 times more efficient. Fusion energy produces no greenhouse gases; any radioactive byproducts degrade from 50-100 years; and the danger of catastrophic meltdown with fallout – a very real threat with fission – is absent. But there are still limitations. The best performing Tokamak (the cylinder in which the reaction would occur) has only been able to get a ratio of 7/10ths, meaning that for every 7 units of energy that this reactor produces, another 10 need to be injected into the system. Obviously, the technology isn’t completely there, but with the promise of ITER, this ratio could be increased 30-fold. 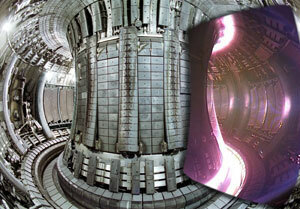 By 2030 or thereabouts, it’s estimated that we’ll have commercially viable fusion energy. Most importantly, the fuels that this energy depends upon are in ocean water. Certain strains of algae have a lipid content as high as 70-80%, which is hands-over-fist beyond the oils present in other forms of bioenergy. In fact, the yield of certain strains is about 5,000 to 20,000 gallons per acre, per year; this represents a 7 to 30-fold improvement over the next best crop (Chinese tallow – 700 gallons/acre/year). Another rarely recognized truth of algae oil is that it would be grown on land that is generally considered ‘desolate’ and ‘infertile,’ largely because the algae would best thrive in open ponds in the desert. And most importantly, algae eats carbon monoxide like a pothead with the munchies. 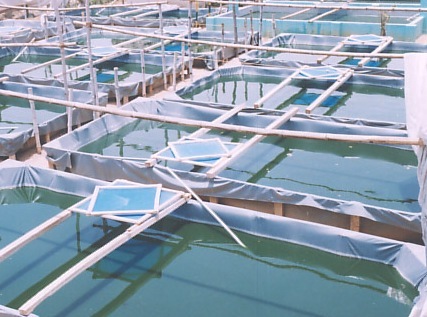 Therefore, any carbon dioxide produced by burning algae fuel could be circulated back to growing algae in the ponds, creating a near carbon-neutral footprint. Of course, providing the large amount of water necessary to cultivate this algae is one challenge. It’s estimated that – in order to replace our entire oil consumption with algae fuel – we would need a land area about 1.3 times the size of Belgium. Back in the days, everyone gave PVCs a bad rap. But that was when the average cell only captured about 20% of the sun’s energy. Now, cells from Boeing’s Spectrolab Terrestrial Solar Cells can capture over 40% of the sun’s energy. At the same time, venture capital is flocking to solar as new techniques for capturing the sun’s energy are coming up, including ultra-thin films that can be applied to surfaces like a sticker — even a paint-on photovoltaic! The push in investment has made solar competitive with its dirty step-sister, coal in cost per Watt. 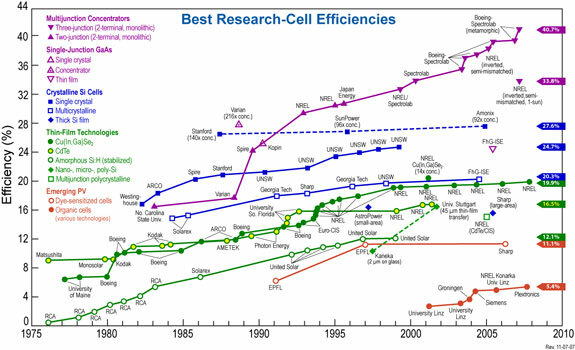 Efficiencies of different Photovoltaic Cells throughout history. Despite all these great strides, the downsides are still present, including the fact that solar still produces negligible amounts of greenhouse gases (currently about twice the footprint of wind turbines), the high use of cadmium in solar power, and the high costs associated with production (which are only recently being cut). This entry was posted on Sunday, March 30th, 2008 at 6:38 pm	and is filed under Geography in the Media, Physical Geography. You can follow any responses to this entry through the RSS 2.0 feed. You can skip to the end and leave a response. Pinging is currently not allowed. Thanks for this info. It’s the first uplifting information I’ve heard all month. The algeal biofuels are interesting because they could make use of all the arid BLM land in states such as Nevada. I’m going to read up on this. Thanks Andy. I think algael biofuels hold the most promise, but fusion holds the best long-term promise because algae is very water intensive and the Western U.S. is missing much of that. I’m interested in seeing how things progress. Very interesting – one thing to consider. The energy problem may be solved in somewhat more conventional means. Obviously as we start to see strains on energy AND agricultural resources it becomes evident that we’ve been able to successfully contain and/or delay major epidemics that kept things in check in the past. There are checks and balances in the natural course of things. The flu pandemic of 1918 killed 20-40 MILLION worldwide – a 2.5-5% global mortality rate. Something like avian flu could do the same, or worse. And that’s not even mentioning the nutjobs with chem/bio weapons in development or at their disposal. We only face shortages today because the global population has boomed in the last two decades. Some natural or man-made event which has major population effects makes the energy issue somewhat less pressing. Probably fusion is not so practicle, it is indeed very seductive, but a long way off, it has been the panacea of the future for the last 40 years or so. Algae? interesting but not going to get the funding it needs and it is land intensive, something that the growing developing nations don’t have, population growth is the issue at the root of every current issue with energy, food supply, and environment. In asia there is a rice shortage in some parts, (Philippines) the likelyhood of diverting land to biofuel production is slim. That said there is a growing interest in Ethanol in parts of Asia, but again the returns do not reflect any great saving of petro fuels as they are required to make it, transport it. Photo votaics hold promise if the efficiencies and costs can be reduced. Thanks RHB, and Eric. I think both of your stances’ hold their valididity. I tend to think that photovoltaics are a good short-term solution. However; in order to make it competitive with coal, oil, nuclear, we’ll need to adopt new technologies. This is very interesting, but with nuclear fusion is nuclear waste a limitation? I believe it is and I don’t know how we will solve that problem, This is fascinating though. When did you write this article? Thanks for you insight. As far as I understand, Nuclear Fusion differs from nuclear fission in that it creates very little nuclear waste. What remains spent is relatively benign waste (which, I admit is a bit of an oxymoron), but what many scientists say is that nuclear fusion waste decays within a few hundred years (rather than that of our nuclear fission plants, which decays in the span of hundreds of thousands of years). Sorry to post on such an old post, but I believe as of today, your first option is being axed all over the world simply because of what has happened in Japan. The other two, while feasible, would have to over come the deathgrip that big oil has on this country and the world. They will not go quietly into the night.